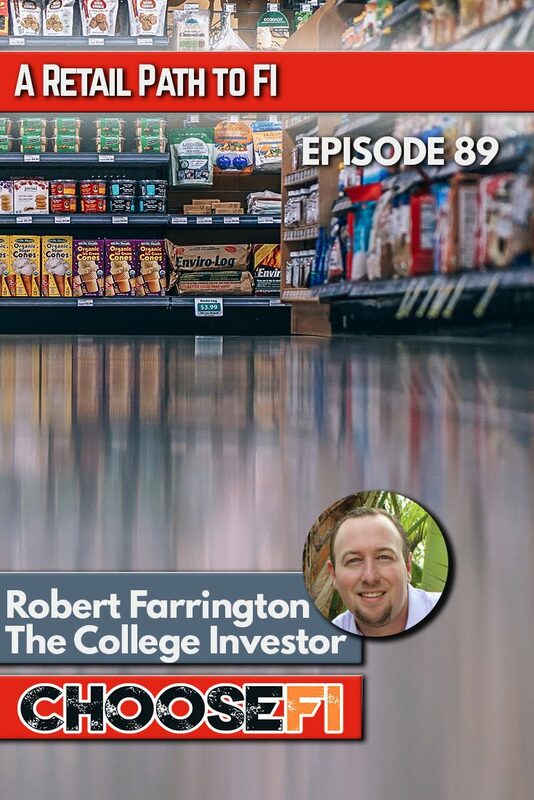 Robert, from The College Investor, talks about his lucrative job as a Target store manager, building his blog into a highly profitable side hustle, his relationship with frugality, and the keys to success in a retail interview. How did Robert end up where he is now – side hustler for life, and founder of The College Investor blog. What was Robert’s original business? How did Robert progress from collecting carts at Target, for the first 17 years of his career? What is Robert’s experience with tuition reimbursement, and does he generally recommend that to students? What were the steps that led to store manager? What’s the key to being a successful retail manager? Does it make a difference where an employee’s college degree? Why are many young adults “over-educated and under-experienced”? As a hiring manager, what did Robert look for during interview? Can you have a conversation with me? What inspired Robert to start The College Investor? How does Robert feel about his first blog posts? When and why did The College Investor evolve from just an investment blog, to address college loans, personal finance, etc. How did The College Investor get to 2.4 million unique viewers per month? What role did does consistency play in the blog’s success? Networking and connecting with other financial bloggers had a big influence on Robert, educating him and building partnerships. Does Robert consider himself frugal? Why does Robert focus more on income than frugality in his pursuit of FI? What factors did Robert consider before he left his job at Target? Why doesn’t Robert own a car? Maxing out your company 401k contributions is different from contributing whatever your employer will match. PrevPrevious088R | What Have You Built? Easily my favorite episodes so far. While I appreciate the frugality mindset that much of the FI community tends of gravitate towards I get much more personal satisfaction and motivation from thinking about the income side of the equation. Fascinating to hear Robert’s journey and his openness in sharing his income. I was surprised and motivated to hear he was making $180K as a store manager at Target and even more surprised and motived to hear he was generating MULTIPLES of that from his blog. Wow, really had to pause the episode and rewind to let that sink in. If you asked 100 people to guess how much a retail store manager who blogs as a side hustle makes I would be shocked if you got many replies over $100K a year. Really shows that we can’t let preconceived notions of what is possible limit ourselves. Great show guys! Appreciate how you drilled down to actionable take-aways and really distilled the key themes in a way any could apply. Will definitely be forwarding this to a lot of my friends who have been hesitant to look into FI due the bias towards conversation on frugality but are much more motivated by the idea of growing the income side of the equation to achieve their goals. Great episode on many fronts. 40+ years ago I worked my way through high school and college in the supermarket. Even then I saw that the people in leadership roles were making good money, as much as $100,000 plus for the managers of higher volume stores – this is a follow up question for Robert: was a portion of his compensation as store manager dependent on dollar volume or similar goals? As some retail stores do better than others across the market place, one would expect that compensation varies accordingly, within the same chain. When a manager is first placed, it is probably in a smaller store and they have to prove themselves to get the bigger stores and the better compensation. Even managers can move up to district and regional positions where I would imagine the compensation is better (and the work hours might be more steady unless there is a major crisis). Note the hierarchical structure of this though – just as there are only 500 CEOs in the Fortune 500, there are a limited number of store manager positions and a smaller number of positions above this (although admittedly many more than there are F500 CEO positions). Still, if one is good at this and determined to succeed, and patient, and perhaps willing to relocate, it can happen. As brick and mortar stores are closing shop though, one should be cautioned about looking at this 10 and 20 years out. I had this choice in front of me when I graduated college. Even as a higher-end member of the stock crew my annual wages were about the same as the first professional salary I received. I was looking at my future though and took the professional IT patch, which I do not regret. Kudos to Robert – his work ethic and people skills have put him in a great position. There is much we can all learn from this. His advice on persistence in getting a blog off the ground is encouraging. Much appreciated. This is a lapse I must learn to correct. Compensation was based on volume as much as experience and hitting metrics. My starting salary as a store manager as a low volume store was $100k. The bonus at that level was 25% for hitting all my metrics. Then, promotions over the years netting as much as 10% raises, and bumps for moving to higher volume stores, raised the base and the bonus amount (upwards of 50% if you hit all the metrics, which was tough – but 25-40% was achievable). Note that it is possible for assistant managers to make $100k+, and there are a LOT of assistant managers in big box retail. Figure each store had 6-8, then multiply that by each store. They don’t get as high, but $100,000 plus a bonus around 10-15% is possible even as an assistant store manager. I love how Jonathan’s mind is literally blown at least a couple of times each episode. This episode is a GREAT reminder that anyone really can rise up from wherever they are based on choices. I, too, worked retail (“only” 11 years at RadioShack) and made some handsome money in my 20s. If you start at the bottom and work harder than the people around you, good things will come and you will climb. Unfortunately, we’re told that retail is a temporary job for losers, and that you can’t get ahead because of xyz. Brad and Jonathan, thanks for digging deeper on each question to get to the nuts and bolts. Granular? Sub-Granular? No, we need sub-sub granular. You two do an excellent job at this! Robert, great story, you rock! ps If I started a blog I think “Handsome Money” is in the running for a name. I just decided.